Trikonasana is also known as "Triangle Pose". Trikonasana is the combination of 3 Sanskrit words, 'Tri' + 'Kona' + 'Asana'. 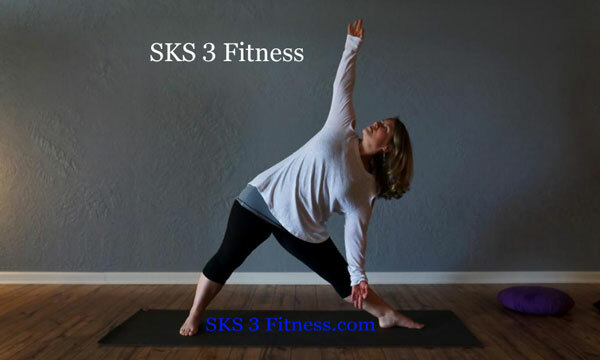 Where, Tri means 'Three (3)', Kona means 'angle', and Asana means 'Pose'. Trikonasana or Triangle Pose comes under the Standing Yoga poses. Stand in Tadasana, straight with legs together and hands straight down touch to the side of the thighs. Take couple of deep breath and calm your mind. Now take distance with your feet shoulder width apart. Raise the arms to shoulder level. Now slowly bend from hip-joint (Pelvic Girdle), at the same time move/change angle of right foot as shown in pictures above. Touch the right foot with your right hand and extend left hand towards the ceiling, so your arms make 180 degree angle. Stay in this pose or Hold this pose for few seconds, with normal breathing. 10 seconds are enough for beginner. Then slowly come to the starting position. Stand straight with legs together and hands straight down touch to the side of the thighs on Yoga mat or floor. Now just change the side, this time bend to left side from hip-joint (Pelvic Girdle). Repeat the steps from 1 to 6. * Bending from Hip-Joint and Waist are different. Waist is slightly above the Hip Bone-Joint. Bend from hip-joint (Pelvic Girdle) only, not waist. When you touch the feet, do not look down. When you touch the feet, look at ceiling or sky. Don’t try to bend beyond capacity. You can slightly bend your knee, if you are not that much flexible but try not bend your knee. Trikonasana is helpful in weight loss and fat loss. This Yoga pose improves flexibility of spine. Trikonasana strengthen leg, knees, ankles, arms and chest. This yoga pose stretches shoulder, chest and opens leg muscles like hips, thighs, calf’s etc. Regular practice of Trikonasana yoga pose improves balance and co-ordination of the body. This Yoga pose increases Physical and Mental stability. This Yoga pose relieves the pain in back & neck. Trikonasana Yoga pose helps to remove fatigue and laziness. This Yoga pose is helpful to increase body height in growing children. Trikonasana Yoga pose improves digestion. Those who have knee-joint pain or ankle-joint pain should avoid to do One Leg Pose or Eka padasana. If you have a Low or High Blood Pressure, Headache and Insomnia then avoid One Leg Pose. The variation of this Yoga pose called "Parivrtta Trikonasana" means "Revolved Traingle Pose".